It's still strange to me that I moved from my hometown of San Diego, which is known worldwide for it's idyllic weather and moved to Riverside County which is weather bipolar. In this area, you will need a sweater or light jacket in the morning and you will be sweating like crazy by mid day. It makes it really hard to plan out your wardrobe and makes shopping for clothes very hard since you don't know if a season will ever really arrive. This past week has been crazy hot, we are talking high 90's, and then today we woke up to a very foggy, gray and cool day. Luckily Cici has her new Andrea boots which we got her specifically to enjoy this past fall and winter. Munkey is all about the boots, always has been, and when it came time to select one Andrea style, it wasn't easy. She finally settled on a style that was missing from her shoe collection and that is a riding style boot. 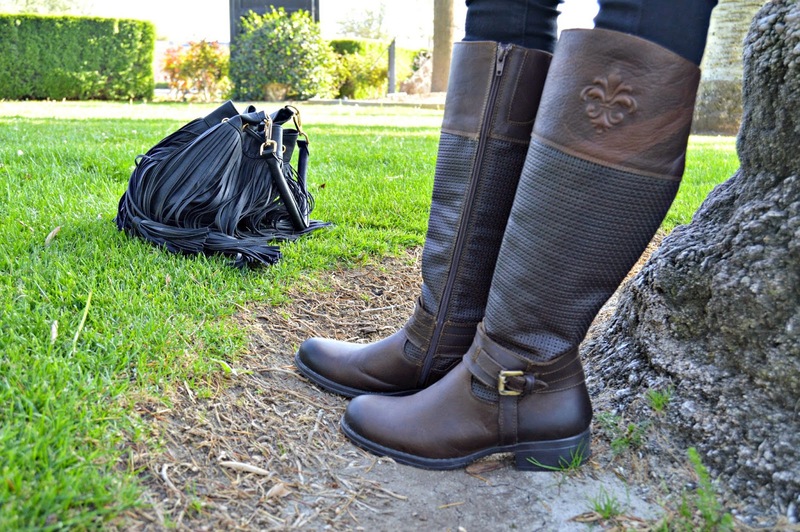 With these elegantly designed riding boots, she can put together many looks which are perfect for her lifestyle and the ever changing weather patterns of the Inland Empire. Have you ever thought about starting your own business? As a woman who works for herself, I can't tell you how rewarding it is to own your own business. I worked for so long for others, putting in so much energy and time while the person being benefited was never myself. When you are your own boss, you have that incentive to put as much time and effort as possible, because at the end of the day, you are working for YOU. Andrea has been empowering women to start their own business for more than 40 years. Andrea is a Mexican company with more than 130 branches in Mexico and in the U.S. They are a catalog style business that offers a lot more than just shoes. Becoming an Estrella affiliate is an easy way to not just own your very own business, but to have a way to update your shoe closet at a discount. This is one of those great businesses that allows you to grow as far as you are willing to work. If I have one wish for my kids besides leading a healthy and happy life, it would be that they never work for anyone. Having your own business, generating your own income and being responsible for setting your own schedule is priceless. I hope at least two of them follow me in the path that I have set out for them, with businesses like Andrea, earning money from home is a total possibility. Learn more about becoming an Estrella by following Andrea on Facebook and Twitter.